We've gotten so much snow this winter. There's been two blizzards, & I stopped keeping track of all of the other snow days. It's gotten to the point that any snowfall under five inches feels like a dusting. A week ago, they listed the areas that have seen the most snowfall. Lowell had gotten 111 inches of snow in less than a month & Boston had gotten 96 inches! It's continued to snow since then. While in Chicago with my girlfriends, I was amazed to see patches of grass in the city. Our grass has been completely snow covered for so long, I had almost forgotten what grass looked like. 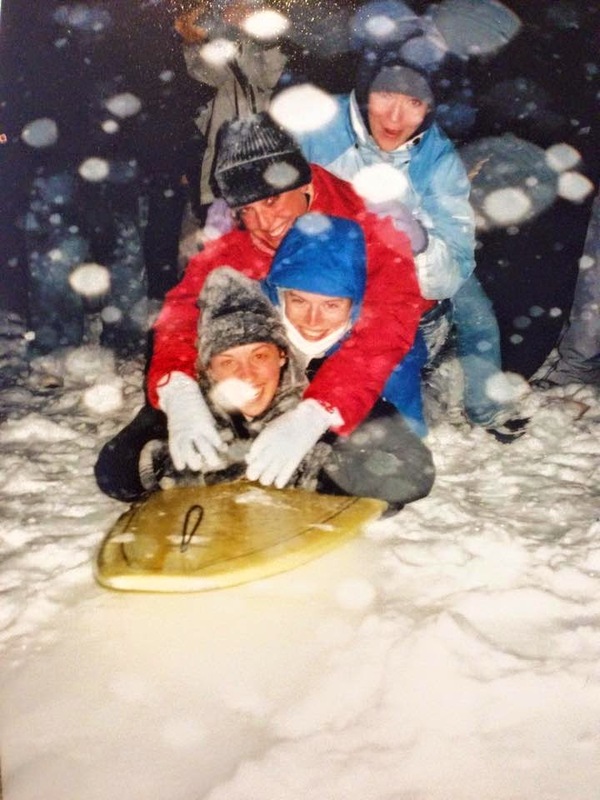 Being together during the wintertime, got us thinking about snow days in college. I remembered dialing 4-SNOW incessantly until the recording on the other end of the phone announced that classes were canceled. There's something so magical about a whole campus shutting down for a snow storm. All of a sudden you & a campus full of friends have no responsibilities for the rest of the day. It's amazing. Back then, we were college kids with little money. 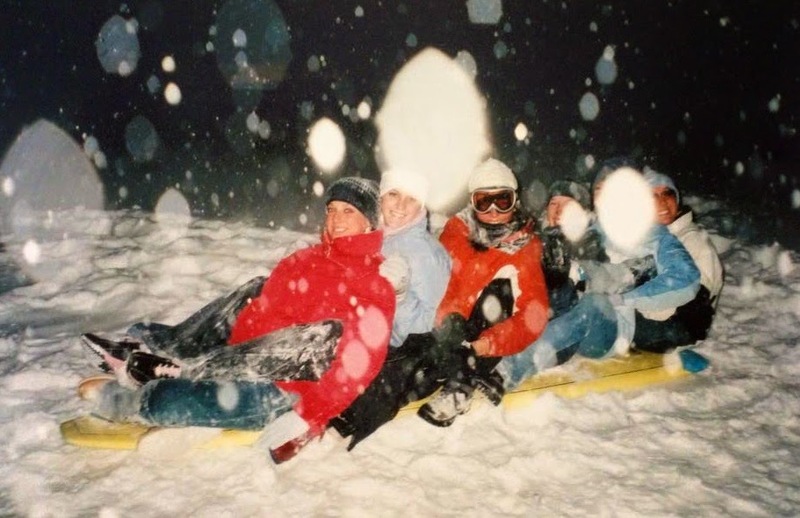 Very few of us sprang the $10 it cost to buy a snow tube (besides, where would we store it in our tiny dorm rooms afterward?). 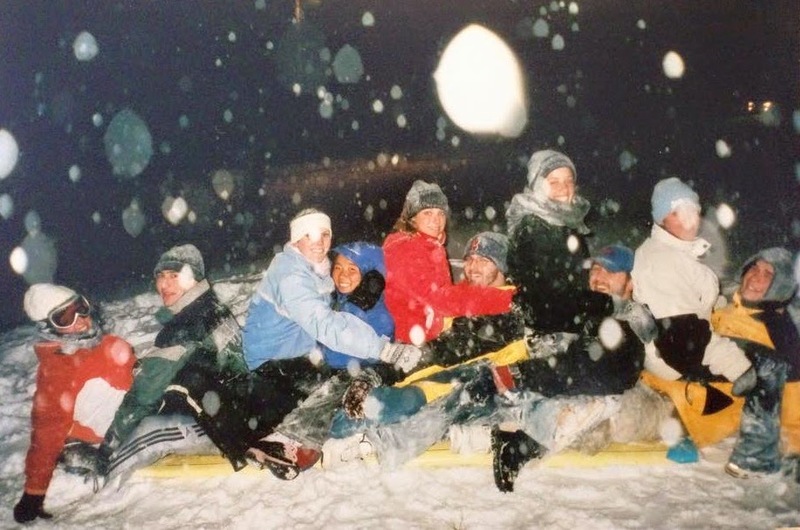 The quintessential thing to do was to "borrow" a dining hall tray & use it for sledding. 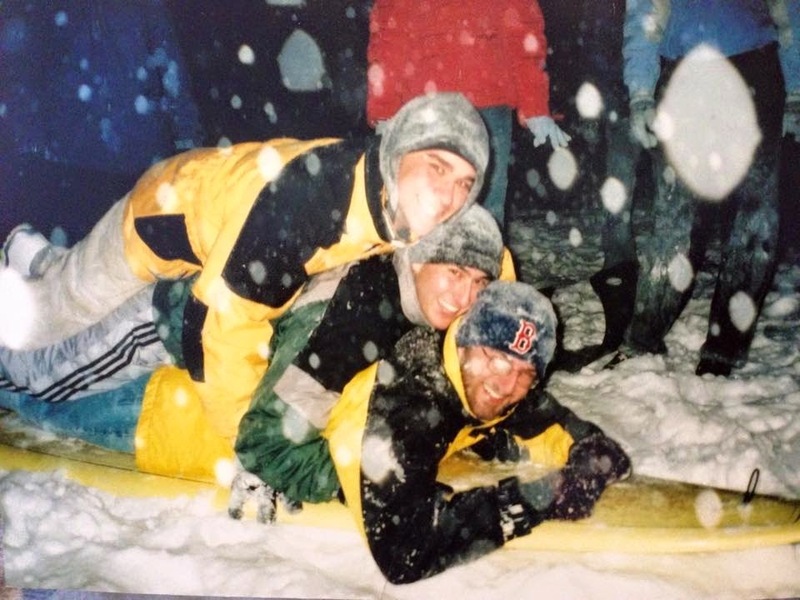 I shared a few dining hall tray sledding days with your daddy & my friends, but I have to say my best college sledding was done on a surfboard. On one snowy evening when I was in grad school, one of the RAs I worked with saw someone putting a broken surfboard in a dumpster. You know what they say about one man's trash being another man's treasure? While I'm sure broken surfboards are not great for surfing, they are perfect for sledding. The snow was coming down heavy that evening. 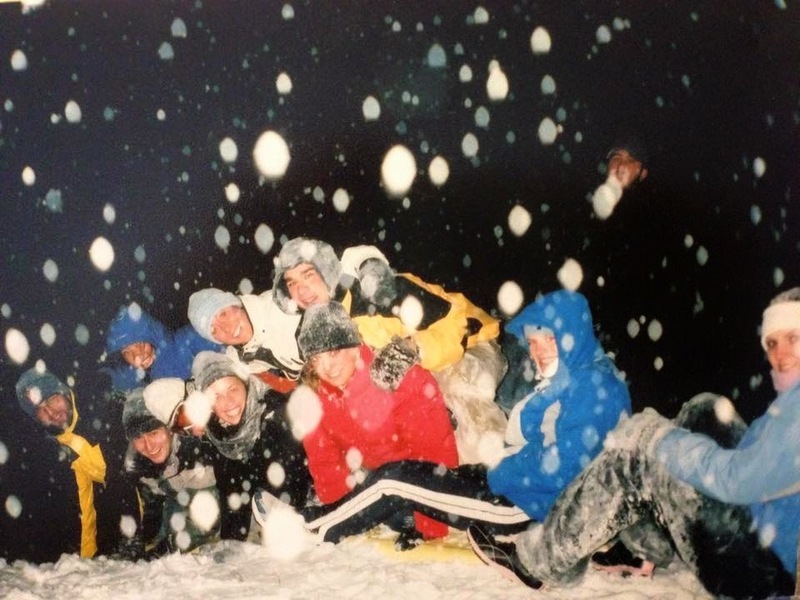 I bundled in my orange ski jacket & ski goggles & joined a big group of RAs for sledding. 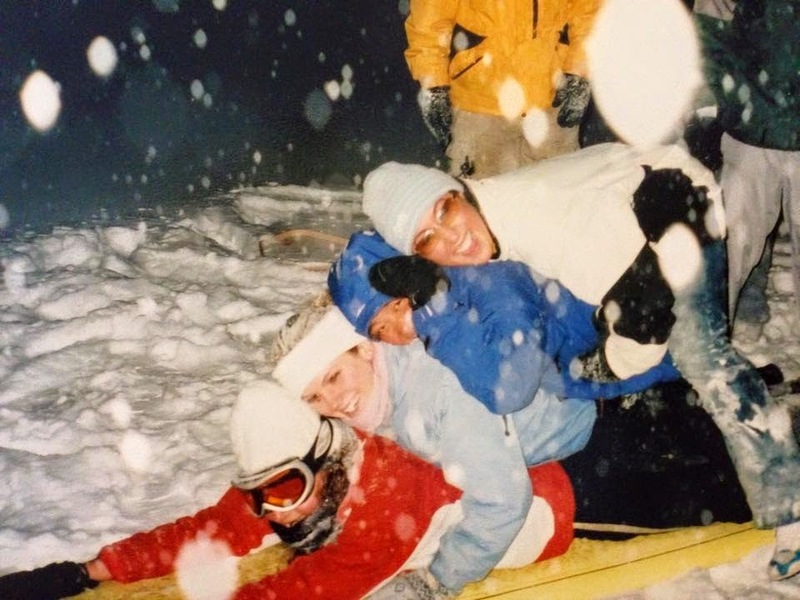 We used the broken surfboard like a toboggan & tried to fit as many of us on the board before sledding down the hill. It was absolutely hilarious & so much fun. 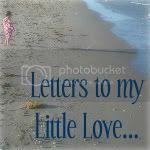 While I love the life we live now, Daddy & I sometimes miss our college days. It was so fun to live within walking distance of so many of my friends. You never knew where the day would take you...like some days you might find yourself sledding on a surfboard with ten other people. Ha! I'll tell you this, a broken surfboard would really come in handy this winter.